It’s hard to believe 50 years will have passed since the very first Oregon Country Fair in 1969. What started out as a benefit for an alternative school has, through the years, established a rich and varied history of alternative arts, educational opportunities, land stewardship and philanthropy throughout Lane County. The Oregon Country Fair creates events and experiences that nourish the spirit, explore living artfully and authentically on Earth, and transform culture in magical, joyous and healthy ways. That being said, an anniversary celebration is in order, a big celebration. 92.5 KOCF (The Fair’s Official Radio Station) and The Oregon County Fair are throwing a party. What better way to celebrate the Fair’s original autumnal event than with a Halloween Ball and concert. KOCF Program Director Andy Goldfinger will emcee and preside over the festivities. He will be joined by a crack panel of judges for the costume contest that will include KOCF deejays, city officials and other dignitaries that will decide the costume contest winner. This Halloween Ball would not be complete without ample entertainment. 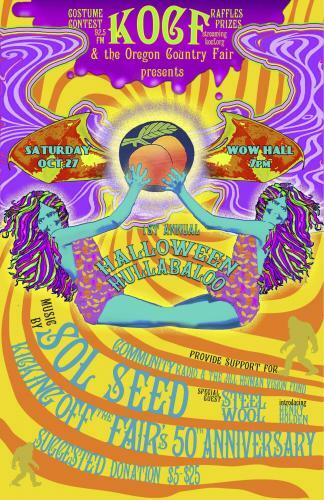 The evening’s musical interludes will be provided by area favorites Sol Seed with an opening set by Steel Wool, and introducing Henry Holden. These musicians are masters at their craft and are sure to provide a musical experience that everyone will enjoy. Join us for this celebration of family, fun and folly October 27th, starting at 7pm at the W.O.W. Hall, located at 8th and Lincoln, in Eugene. There will be a raffle to benefit the Fair’s philanthropic Jill Heiman Vision Fund, great music and entertainment. What better way to show your support for community radio with your sliding scale donation at the door. And don’t forget the costume contest and door prizes! The Oregon Country Fair is a nonprofit, year-round philanthropic organization. Each year, the Oregon Country Fair holds a 3-day fundraiser on 300 acres along the Long Tom River featuring some of the finest music, crafts and artisans in the country. The Oregon Country Fair provides grants, sponsors events and supports numerous local non-profits, as well as offering its own youth camp, Culture Jam. The Oregon Country Fair strives to honor community diversity, care for the earth, support arts and performance, create participatory experiences for youth and elders, develop a healthy spirit of volunteerism, foster effective communication and make community outreach and philanthropy a priority. Information is always available at OregonCountryFair.org. KOCF is a low power FM radio station serving the Fern Ride Communities of Veneta, Noti, Elmira and surrounding areas. On the air since July, 2015, KOCF provides local programming 24 hours a day 365 days a year. As an integral part of the community KOCF gives local organizations and communities an opportunity to offer information relevant to their neighbors. The station has forged a relationship with community leaders and organizations that helps foster the growth and connections in these local areas. KOCF also streams globally from kocf.org and can be heard on any type of device anywhere on the planet. Eugene's own Sol Seed brings a distinct sound combining elements of Rock, Hip Hop, Soul, World Music and Psychedelic Jam with a Reggae foundation to form a positive musical fusion that is uniquely their own. With thought-provoking lyrics, infectious grooves and high-energy live performances, Sol Seed creates an unforgettable live-music experience for people of all ages to enjoy. Music created with the intention of spreading unconditional love, universal acceptance, and reaching across social, spiritual, and cultural boundaries. That’s Sol Seed. Steel Wool is an upbeat and happily serious acoustic rock band that breathes fresh life into deep grooves cut by time and experience, bringing acoustic rock into the 21st century. Powered with smooth harmonies, these four veteran players will grab your heart with real stories of joy and pain and the craziness of the world we all share. Featuring Tim Mueller as songwriter, lead vocalist and guitar player; TR Kelley (Babes with Axes) on bass and vocals, Nel Applegate (Mudzidzi) on mbira, djembe, percussion and vocals, and Randy Hamme (Raventones) on drums. Steel Wool, from Eugene, Oregon, will light your fire with the haunting mbira, inventive bass lines, danceable grooves and world beat percussion. Henry Holden is an extremely talented singer songwriter with a large cache of original material as well as cover songs. He has a generated a large following here in Eugene and has been performing in Northern California and locally. Henry has played at Whirled Pies in Eugene, Devils Canyon Brewery, HAPA's Brewery, The X Bar, Punk Dog Winery, Redwood Grill Restaurant, Red Rock Coffee Shop, and the St. Charles Fall Festival in the San Francisco bay area to name a few.